For those of you who are fans of the Reviewing/Tracking Changes capabilities in Microsoft Word are going to be truly excited about the latest feature Google unleashed in Docs. Open a Doc and you'll see this new feature in the upper, right-hand corner as shown here. 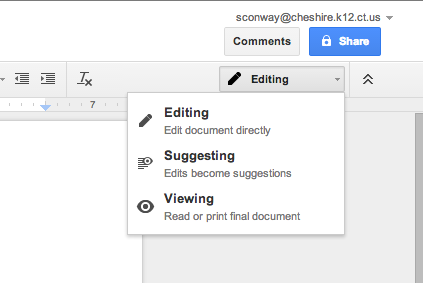 This will allow collaborators to continue to directly edit the doc while operating in Editing Mode, but will now also allow them to switch to Suggesting Mode, which will convert edits to suggestions that collaborators can either accept or reject. While the document is in Suggesting Mode, collaborators can utilize the Viewing Mode to read or print the final document as-is with only the accepted edits. The educational impact of this feature may very well come in the form of collaboration between student and teacher as this will make individual student conferencing easier for both. The new Suggestions Mode makes leaving suggestions for students much easier and more effective for teachers than inserting comments. Give it a try for yourself and you'll really see the benefit.